B&W Tek will be exhibiting the BAC201, a fibre optic Raman probe designed to expand the capabilities of the company’s portable Raman systems. 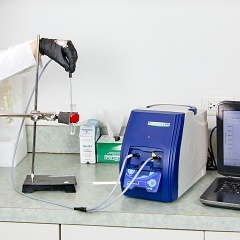 The addition of the probe means a Raman spectrometer can make measurements in difficult-to-reach or small places, such as inside cavities, tissues or miniature reactors. Available for both 785nm and 1,064nm excitation, the needle probes can be used in direct contact or for immersive measurements. They are designed for biomedical applications, such as tissue studies, or other in vivo measurements used in cancer diagnosis. The probe end is constructed with a single 200μm core laser fibre surrounded by nine 200μm core return fibres, all encased in a 3.0mm OD stainless steel needle tube. The tip is sealed with a fused silica ball lens, which allows for high throughput and easy cleaning. The optical elements inside the needle are permanently fixed in alignment, with no possibility of movement from impact or vibrations.